Once called the Spanish Steps, a steakhouse has been located on this corner of the sprawling Caesars casino as long as ELV can remember. For some reason (mainly having to do with his abhorrence of mediocrity), he had always avoided eating here. When these questions were confirmed in the affirmative, and all doubts quelled, he was in faster than you can say postmortem myofibrils proteolysis. The reason ELV goes on and on about dry-aged beef is because it just tastes better. Good chefs and meat men know this, but many of them would like you not to pay attention, and settle for the serumy/bloody/metallic tasting cryovac’d stuff that makes them more money because it doesn’t shrink an ounce or two while it’s in the fridge. But by valuing size over substance, those same purveyors of mediocrity fail to deliver a product that has naturally tenderized and developed that luscious, brown-roasted, beefy flavor that true carnivores crave. The cool thing about Nero’s is that it serves some of the best, dry-aged steaks in town — better by far than more well known places — and no one is bragging about it (although they should be). Perhaps that will change soon, and when it does, expect a meat eaters stampede to this under-the-radar place. For while the beef here doesn’t come cheap (all steaks are in the $45-$52 range), at least you get what you pay for. On the negative side of the ledger (Hey, we’re a critic, we gotta criticize something! ), whoever decorated the joint obviously learned their trade from this guy. The tables and chairs are plenty comfortable, but the art on the walls looks like something you buy at a roadside stand, and the whole joint has a dark, cheesy, 70’s vibe to it that belies the fact that it is only a few years into its present incarnation. We weren’t especially keen on the huge and tasteless scallops either, but sommelier Scott Kaplan chose an elegant King Estate pinot gris to go with them and the nice, crabby crabcakes, so all was forgiven. The onion soup was also a worthwhile version, but would have benefited from a dollop of cognac, the way they serve it in Gay* Paree. Within two bites, Nero’s 14 oz. New York strip entered ELV’s pantheon of great, dry-aged, Vegas steaks. With a bit more char on the crust it would’ve perfect, but as it is, you’d be hard pressed to find a more mineral-rich, umami-laden sirloin. The veal chop is nothing to shake a stick at either. Carnevino: Cote de boeuf (double rib-eye) for two. Craftsteak: Wagyu skirt steak (not dry-aged, but so beefy it’ll take your breath away). We may have missed one or two, but these should give ELV’s faithful readers something to chew on for a while. 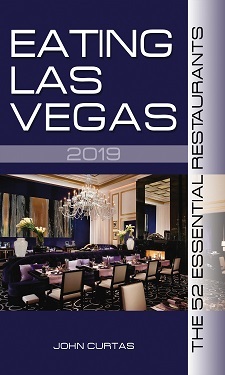 For another take on Vegas steaks, albeit one with overwrought prose and dubious choices (way too much wagyu, then trips to Robuchon, Savoy,** Flay and SeaBlue for steaks? ), click here. * As in: fraught with merrymaking and mirth. ** Having Guy Savoy or Joel Robuchon cook you a steak is like getting Picasso to paint your house. The Men’s Journal piece is amusing but an incredibly random and uneven survey. I thought the Prime hangar steak at Craftsteak was the real standout–and a relative value. have you ever been to Golden Steer? I have eaten at Neros and I love the place. I would go back over and over again. I also loved eating at Emerils in Vegas when I was there last. The veal chop at Neros is one of the tops in the city – perfectly cooked everytime I’ve eaten it – charred some but moist and juicy inside. The Brussels sprouts last time I was there were also very tasty, as was the mac and cheese. The bone in ribeye, too big to eat in one sitting aside, is also a great selection. Our party of 6 had dinner at Nero’s this past Friday and it was very, very good, with a couple minor faults. Started with the Iced Shellfish Platter and Oysters on the Half Shell; the oysters were very tasty, but on the small side. The shellfish platter was very tasty – the lobster and crab were perfect; the jumbo shrimp were very large and also perfect; the musselsd were also veert tasty, but the clams were quite fishy – they were the only item we didn’t finish. For entrees we had two orders of chateaubriand, a 16oz new york strip and a berkshire pork loin – all were cooked exactly as ordered and were very tender and flavorful. The chateaubriand barely needed a knife and the bearnaise sauce was the perfect accompaniment. I don’t recall what sides we ordered, but they’re sides and they did the job. Overall a very pleasent experience and about what I had expected to pay for dinner for 6. Oh, and they also made one of the better bourbon old-fashioneds I’ve had. Would definitaly recommend the place for a top-shelf steak dinner. ps – it didn’t quite measure up to CarneVino, but it wasn’t quite CarneVino pricing either. CV also made a very tasty bourbon old-fashioned for what that’s worth. Disaster not averted! Despite making a reservation twenty-four hours in advance… Our table was not ready. Our service was horrible, I waited sixty minutes for a “dinosaur rib-eye” medium, actually was rare. I was told that maybe next time they would “do better”. I told them “there won’t be a next time”. What a joke this place was, a total waste of $200. Never again!